Caramelize the onions: Heat medium pan over medium-low heat. Melt 1 tablespoon butter and add sliced onions on medium-low heat. Let it cook down for 20 minutes, stirring occasionally. Once onions develop a caramel color, remove from heat and set aside. Unroll 1 can (8 oz) Pillsbury™ refrigerated crescent dinner rolls onto a baking sheet. Freeze for 10 minutes to firm. When dough is chilled, remove from freezer and cut into 8 squares, separating them from each other. 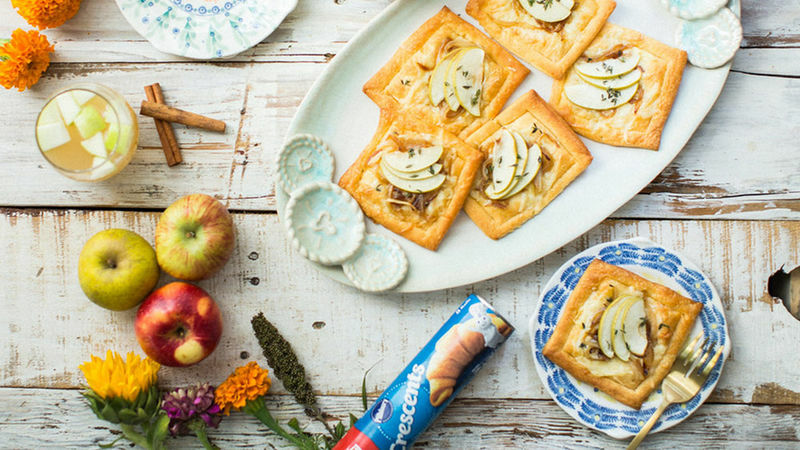 Divide shredded gruyère cheese onto each tart, then top each with caramelized onions, followed by apple slices. Brush melted butter on top. Sprinkle with fresh thyme leaves. With pizza cutter, score the edges of each tart. Bake for 12-14 minutes until edges are golden brown and cheese is melted. 1 can (8 oz) Pillsbury™ refrigerated crescent dough sheet can be used instead of 1 can (8 oz) Pillsbury™ refrigerated crescent dinner rolls.